It's now the question I instantly chuck at any comic con' worth it's salt; 'What slice of Marvel is going to get the next set of killer inter-locking covers by Marko Djurdjevic?' 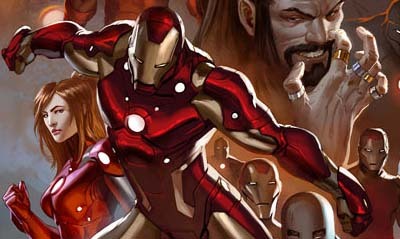 NYCC's answer: Iron Man. Like all good things this tradition started with Daredevil. While that was just a single, wrap-around anniversary cover, the inter-locking madness has already bitten Marvel's Spider-Man, Avengers, and X-Men titles with a healthy dose of eyeball-popping awesome. Now It's Iron Man's turn. Feast your eyes on this; (click to enlarge). While I'm suprised Fing Fang Foom wasn't made a giant of the background, the world of Tony Stark has never looked better. These covers will rock the Iron Man line in 2011. The world of the Fantastic Four still tops my wish-list for who's next, but something tells me Marvel's looking towards the mighty halls of Asgard and Thor, God of Thunder. Talk about your win-win situations. That is really nice to look at! Are you a big Iron Man fan? It's one of the properties I know less about. Hey Arron! I'm more of a Marko fan at the moment so it's up for eye candy reasons as much as anything. I collected Iron Man from the 80's all the way through to this year, where the current direction and my tastes took two different roads, but good art is good art. Glad you liked the pic/post and thanks again for stoppin' by!